Sky’s Geraint Thomas explained that he was lucky to survive this successful round of Belgian races, winning the E3 Harelbeke on Friday and placing third in Ghent-Wevelgem today. The Welshman known simply as ‘G’ bounced back after a crash late into the Ghent-Wevelgem classic. He fought for the win and finished in good position for the upcoming monuments, the Tour of Flanders and Paris-Roubaix. “That crash wasn’t ideal,” Thomas told Cycling Weekly. “Fortunately, it was just on the grass and I was able to get straight back up and get going again. With less than 60 kilometres to race in the 239-kilometre classic, a gust of wind pushed Thomas off the road and onto the grass shoulder. He unclipped his right foot to keep his balance, but went head over his Pinarello bike and landed on his left shoulder. He immediately jumped up after the scare and chased back on to the front group of five only five kilometres later. 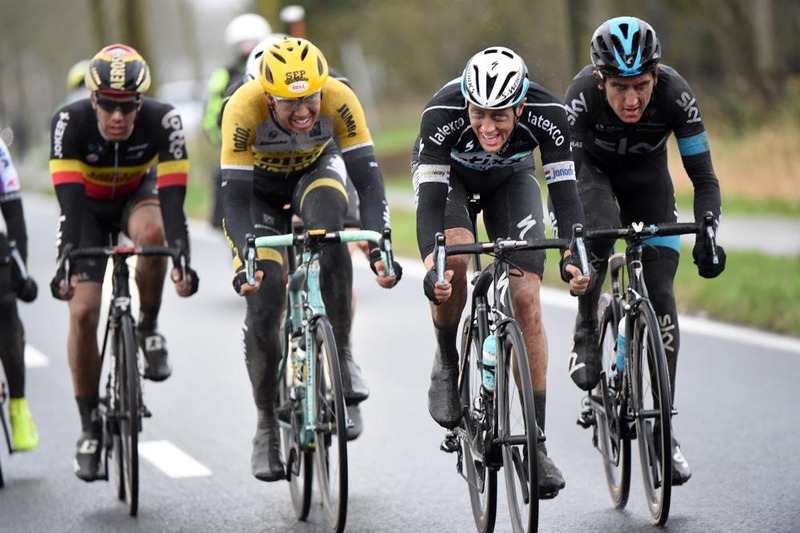 Thomas followed a move by Belgian Stijn Vandenbergh (Etixx-QuickStep) at 70 kilometres to race. Their group grew to seven cyclists, including eventual winner Italian Luca Paolini (Katusha), Vandenbergh’s Etixx team-mate and 2014 Paris-Roubaix winner Niki Terpstra, and Belgian champion Jens Debusschere (Lotto-Soudal). Debusschere’s team-mate Jürgen Roelandts raced solo ahead. His group caught Roelandts with 18 kilometres left. Paolini attacked solo with six kilometres to Wevelgem while the others hesitated. “Obviously, I was expecting Etixx to do more and Jens [Debusschere], as well, because most of the time he sat on. I couldn’t follow everything and I had to gamble a bit. That was unfortunate, but at least I managed to get on the podium in the end,” Thomas added. “When I did get with Niki to chase, at least he pulled with me. Third after a long day isn’t that bad. Thomas will return to race the last two big cobbled classics, Flanders and Roubaix, before taking a break to prepare for the Tour de France. With his win and third place, he is a favourite to win in the next two weeks.